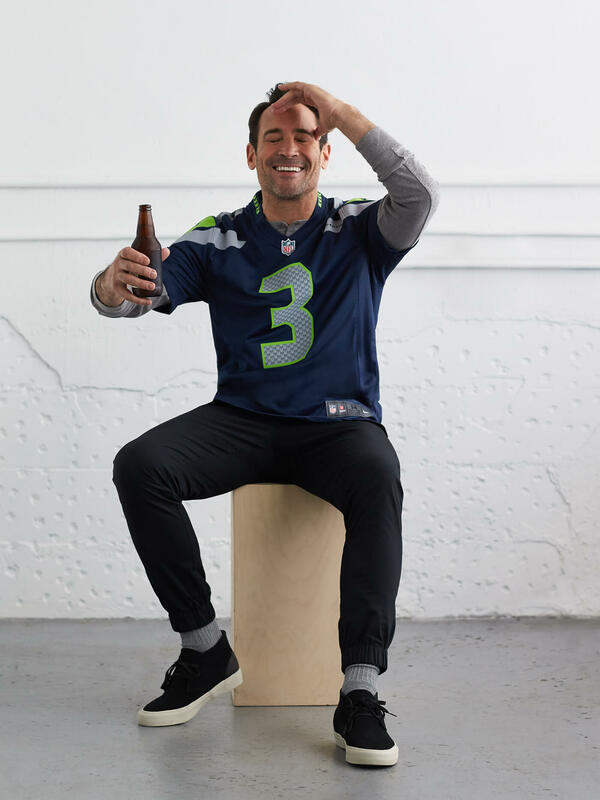 Whether you’re tailgating, going to a party or watching the game from your couch, wearing a jersey doesn’t mean your style needs to get benched. That’s why we came up with a Stylist-approved playbook to show you how to color coordinate your jersey with the rest of your outfit. From classic neutrals to neons and brights, take a knee and view these tips to getting game ready. Keep reading for three ways to color coordinate your outfit with a football jersey. Avoid skinny jeans. The oversized jersey will be a stark contrast to slim legs, giving the illusion you skipped Leg Day at the gym. And we all know that’s not true, right? “Whether it be a white cotton tee or a fitted long sleeve—don’t go bare,” Brittany says, especially if your jersey has a deep v-neck. Why? Well, let’s just say it’ll help your squad focus on the score, not your hairy chest. Does your jersey come in a classic color combo like red, white and blue? You can’t go wrong with keeping the rest of your palette complementary—since the only clashing you want to see is on the field. You can even pull out the jersey’s accent colors when building the rest of your outfit. Just make sure you’re not too matchy; subtle coordination will get you more points. Heading to to a happy hour watch party? Round out your look with jeans and an unstructured blazer. Don’t be afraid to class up the joint. 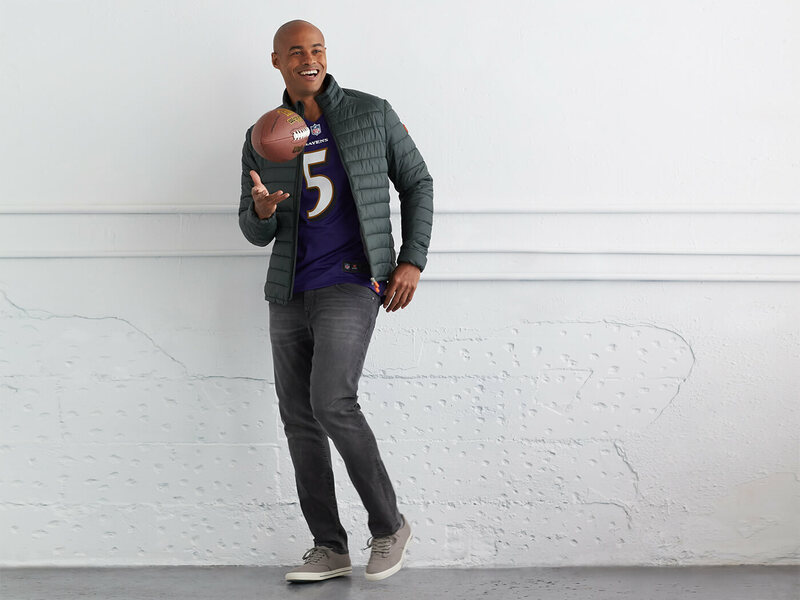 When it comes to tackling tricky, bright shades, like green, orange—or this purple Ravens jersey—just take it easy. Keeping the rest of your outfit neutral is the right play. Dark-wash jeans are always a good call, but you can even try grays or natural shades so your team’s colors remain at the center of everything. If you’re heading to a tailgate party, you’re going to need two things: beer and layers. A puffer jacket in a neutral hue will be lightweight, with maximum warmth—even if you spill a little on it. Have a color—or accent color—that’s a little flashy? Level down the remaining pieces. Your shirt brings the offense on its own, so let it take the limelight. Black and gray go with pretty much everything and work best with bold color combinations. If you’re watching the game at home, throw a henley under your jersey for a cool contrast, then finish your outfit with a black jogger pant for sleek comfort. Add canvas shoes for the touchdown. 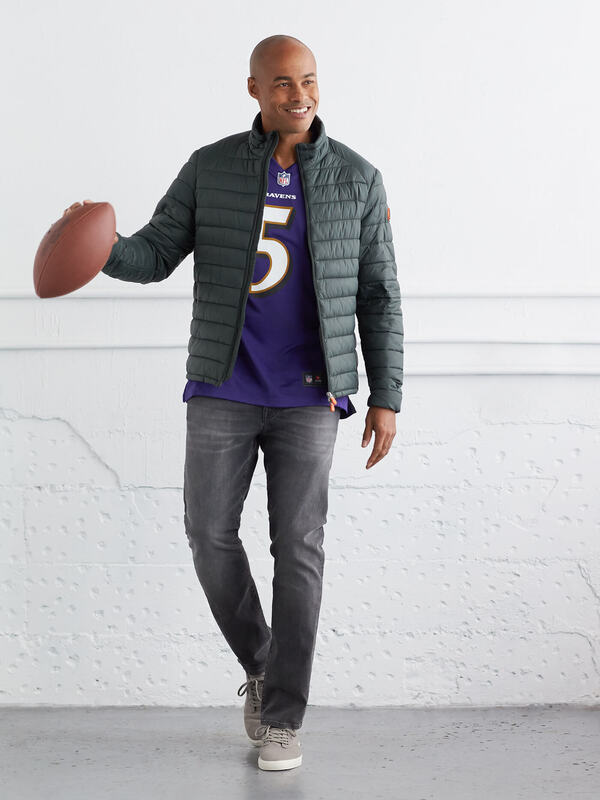 Need a game day outfit—minus the jersey? Schedule a Fix to get one delivered to your door today!